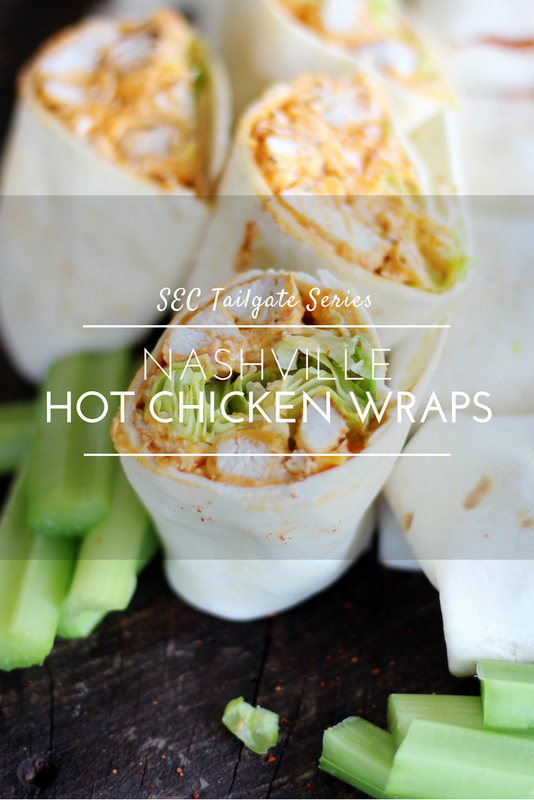 Hot and spicy, full of tangy flavor and loads of cheese, these Nashville Hot Chicken Wraps are the perfect game day treat when cheering on your Vandy Boys. Sometimes hot and always cheesy, the Commodore would definitely approve. So anchor down, grab your groceries, and let’s kick this season off in a big way. Football season is our FAVORITE time of year. We love the weather, the crowds, the crazy football action, and of course, the food! 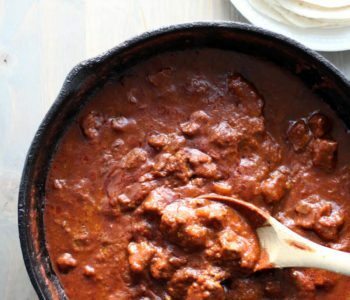 We have created a tailgate recipe for every team in the South Eastern Conference. 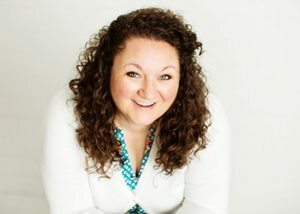 Our goal: to capture the spirit of each school’s team and make a fun and delicious recipe using local flavor and flair. So we put our football differences aside, and researched every school. 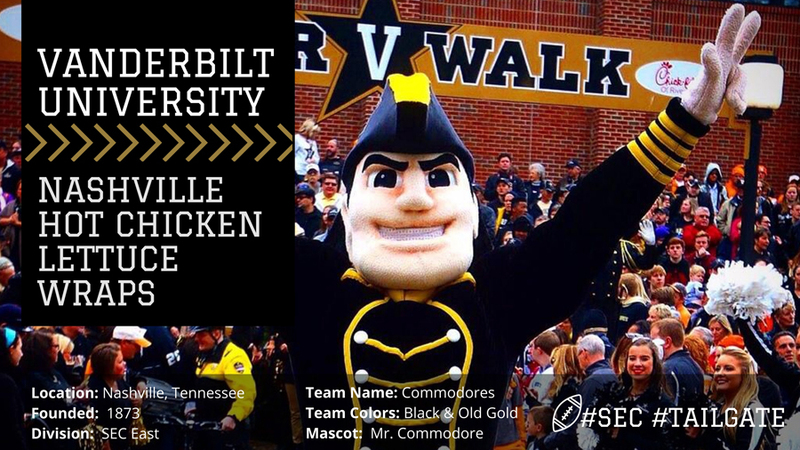 Although I’m a die hard Vols fan …I’ve gotta give the boys over at Vandy credit. They’ve been looking pretty good(ish) over the last season or two. This recipe starts with tender, spicy strips of chicken. 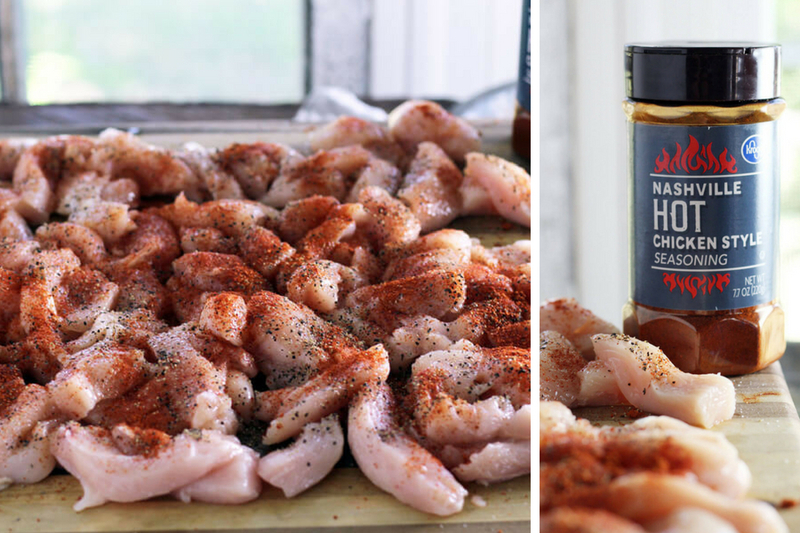 We seasoned it up with our favorite hot chicken seasoning. You can pick it up at Kroger. If you can’t find this one, any hot chicken seasoning will do. 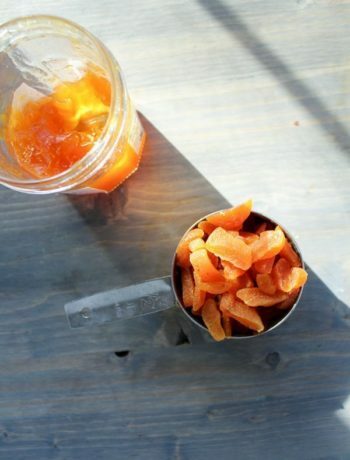 You can also make your own using cayenne pepper, paprika, brown sugar, garlic powder, salt and pepper. Sprinkle the seasoning all over the chicken and toss to coat well. Now into the hot, melted butter to fry up nice and golden. Your mouth will be watering! Cook the chicken in batches. Don’t overcrowd the pan. If you do, the chicken will just sit there and “sweat” and you won’t get this gorgeous color and flavor. As each batch of hot chicken is done, transfer it to a bowl and cover to keep warm while you finish. Let’s talk about flavor for a second. For this recipe, I really wanted a big and bold pop of flavor. Almost like a Buffalo meets Nashville style chicken wing flavor. To get all of that into a delicious chicken wrap, I went cheese crazy. 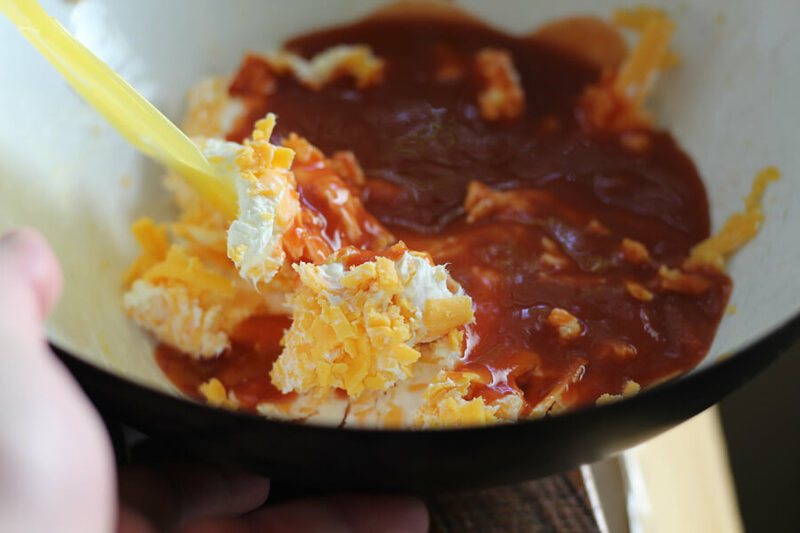 In a large bowl, combine cream cheese, sharp cheddar, and hot sauce. You can use a little or a lot. I used about half a cup of my fave. If you think this is too much, you can add half that amount, taste the mixture, and go from there. To make mixing easier, be sure the cream cheese is softened to room temperature. I also like to use a stiff scraper-type utensil to help blend it together. How are we looking so far, Vandy fans? Next, add all that juicy, spicy chicken (and all the pan juices and drippings) into the cheese mixture. 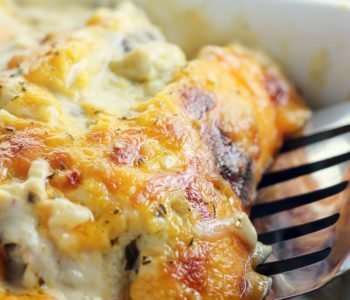 Fold the chicken in to wrap all that hot cheese flavor around each and every piece. All you’ve gotta do now is warm some soft flour tortillas and chop up crisp iceberg lettuce. 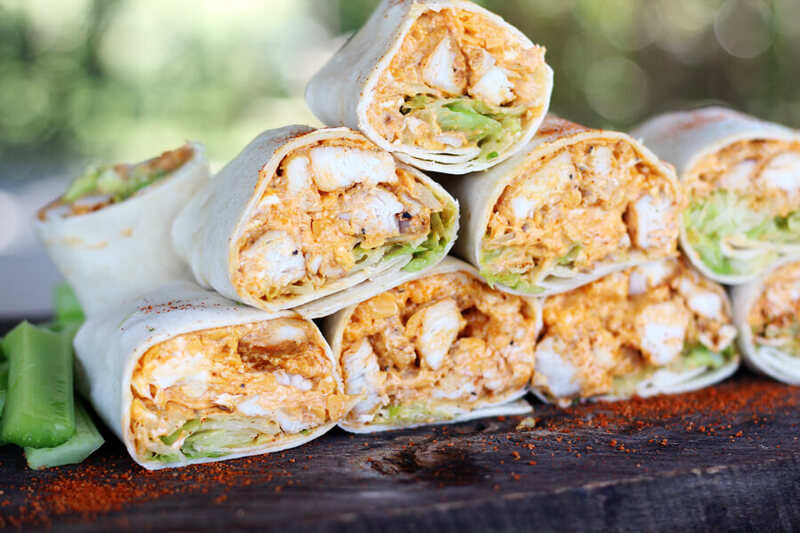 Assemble each Nashville Hot Chicken Wrap “burrito style”, tucking in the sides and folding it over on itself to seal. 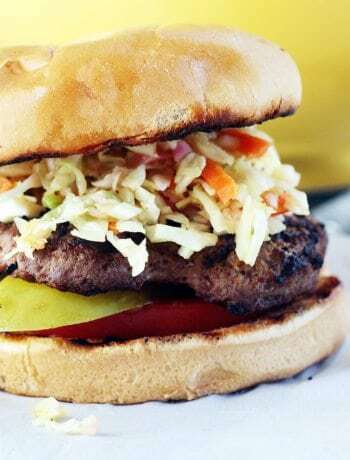 TIP: If you are making these a little ahead of time and it will be a while before serving, use chopped celery or cabbage in place of the lettuce. 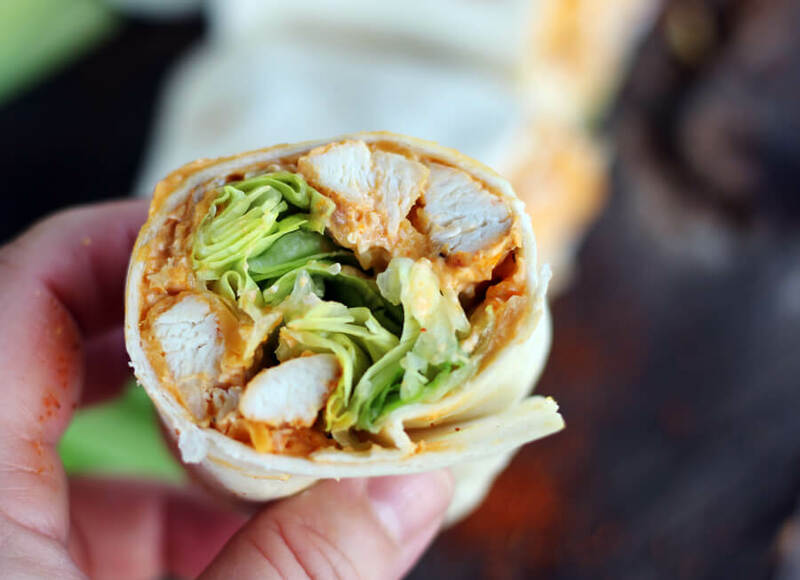 Before serving, slice the hot chicken wraps in half or quarters. 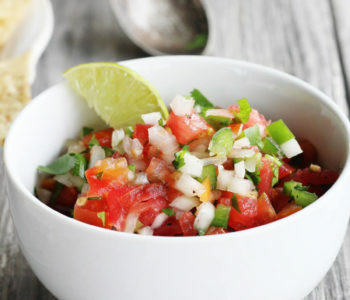 Serve with fresh celery and cool ranch dressing to dip. These are so good. You can make them big or make them small, whatever size tortillas you have. I used 10 inch flour tortillas and the recipe made 8 full size wraps, which was 16 servings. We can’t wait for you to try this recipe. 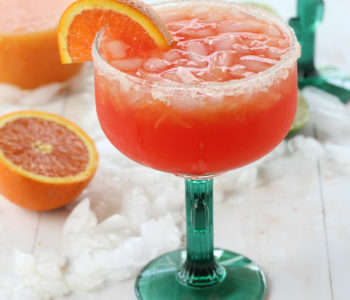 Be sure to check out more of our SEC Tailgate Special recipes and enjoy your football season in a yummy way. 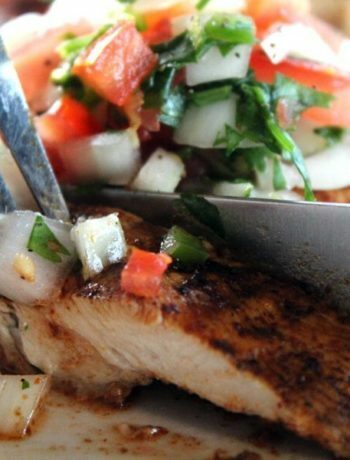 Bold and tangy flavors wrapped around tender, spicy chicken. 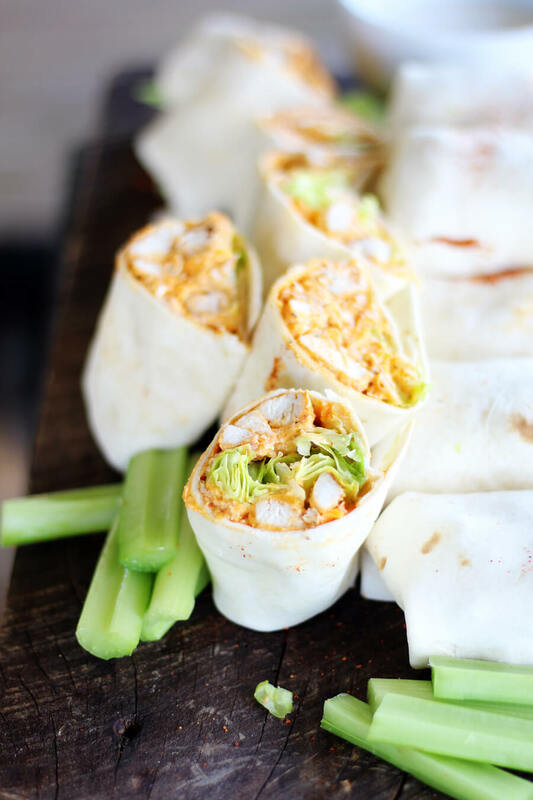 These addictive game day hot chicken wraps are perfect for the big game. Cut the chicken in half lengthwise. 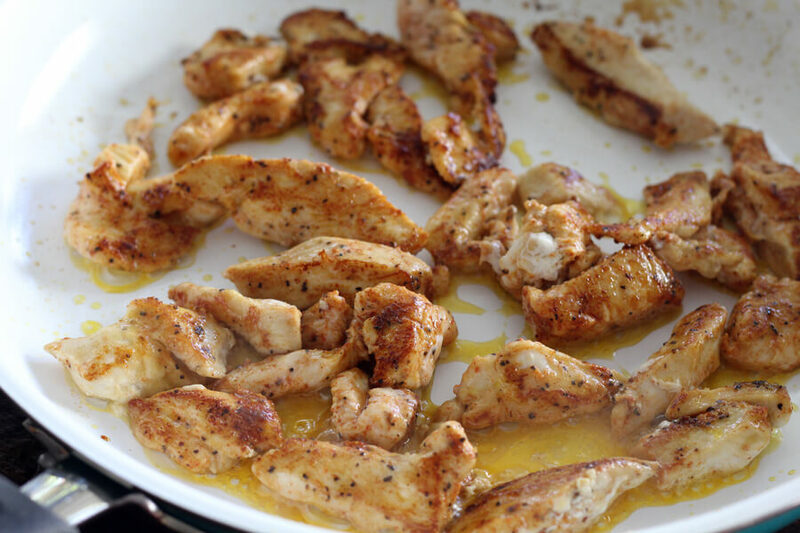 Slice each chicken half into thin strips. Sprinkle the hot chicken seasoning over the chicken. Toss to coat all sides. In a large skillet, heat 1 tablespoon of butter over medium high heat. Add a third of the seasoned chicken. Cook until golden brown on both sides and the center is no longer pink, about 7 minutes. Transfer to a covered dish. Repeat with the other two portions of butter and chicken. When the chicken is cooked, combine the cream cheese, cheddar cheese and hot sauce in a large bowl. Fold in the cooked chicken. 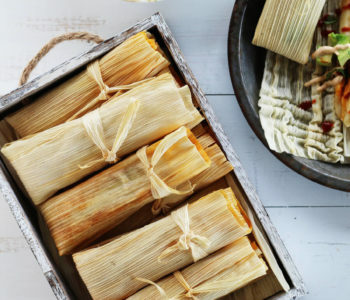 Warm the flour tortillas. 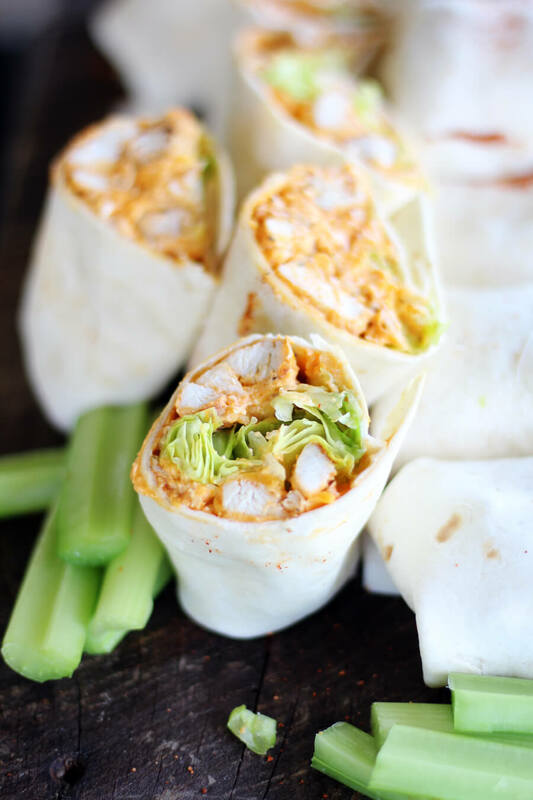 Assemble each hot chicken wrap by adding a portion of the hot chicken and cheese mixture to the center of a tortilla. Top with shredded lettuce. Fold the sides in and fold the chicken wrap over on itself. To serve, cut each wrap in half. Serve with celery sticks and ranch dressing if desired. Nutritional information is based on half a wrap made as described in the recipe, and does not include the addition of celery or ranch dressing.